On Tuesday, Russian Foreign Minister Sergei Lavrov insisted that Moscow would not accept a Framework Agreement over Syria’s chemical weapons that included provision for use of force under Chapter 7 of the UN Charter..
“[The inclusion of Chapter 7 provisions] is abstract, because we need to not about some resolutions on the sixth, seventh, or any chapter, we have to talk about the challenge facing the international community right now,” he said. The move was a likely stalling tactic, intended to drag out discussions over the agreement before it can be implemented, at the same time as announcing that Damascus is ready to comply with it. In parallel, on Wednesday Moscow continued with its tactic of spreading “disinformation” over responsibility for the August 21 attacks, via attempts to muddy the waters over who might be to blame. Both Russian Deputy Foreign Minister Sergei Ryabkov and — in a far stronger statement — Russia’s representative to the United Nations Vitaly Cherkin insisted that Moscow has “evidence” that points to insurgent culpability over the attacks. State-owned news agency RIA Novosti reports that Lavrov told its reporter that Damascus had given “new information” on the attacks, but did not specify what that information was. Nor did Lavrov explain why the Assad regime had not offered the UN weapons inspectors the same information, even though Moscow had insisted that the UN report was essential before any decision over the August 21 attacks could be made. It really is the case. We have just been given tangible proof, what is called clues. This evidence ought to be analyzed. Russia’s UN representative Vitaly Cherkin went farther than Ryabkov, saying there was “multiple evidence” that the August 21 attacks were a “provocation”. There is ample evidence that on August 21 the Ghouta region, was the site of a mass provocation, the purpose of which was to cause a foreign military intervention in the Syrian conflict. This evidence should be most carefully studied. Cherkin did not elaborate on what the “evidence” constituted, or why it had not been cited in the UN report. The Russian approach this week is not a new strategy amid the general issue of its unbending support for President Assad. Moscow has been refining its PR and political campaign for months, both to shield Damascus from blame and to turn that blame onto Western opponents and the “enemies” inside Syria. However, the chemical weapons of August 21 posed a new challenge — perhaps the greatest Russia has faced in the Syrian conflict — to its PR and politics. While Damascus was silent in the immediate aftermath, Moscow was realising that it had a problem: its ally was the likely culprit, possibly using weaponry supplied by Russia or the Soviet Union, and the door had been opened to Western intervention far beyond the existing support for insurgents. The question was stark: how could Russia avoid being on the defensive while protecting its ally and maintaining its credibility? The answer — whether co-ordinated or in parallel — was for Syrian State media and Russian outlets to both declare that if an attack took place, then “terrorists” — the insurgents — must be responsible. Handed an opportunity by bloggers who made quick declarations that munitions used in the attacks were of domestic origin, Moscow said that the attacks were likely a “provocation” by opposition forces who killed civilians with “a homemade rocket loaded with an unidentified chemical agent”. Russia complemented this with a diversion to an earlier episode, claiming that the August 21 attacks closely resembled an earlier assault in Khan al-Assal, killing at least 26 people, which must have been carried out by insurgents and their “homemade” devices. Russian Foreign Ministry spokesman Aleksandr Lukashevich said: A homemade rocket with a poisonous substance that has not been identified yet – one similar to the rocket used by terrorists on March 19 in Khan al-Assal —- was fired early on August 21 from a position occupied by the insurgents. The claim was clearly a false link: not only was it was clear from August 21 that multiple sites — not just one — across Damascus suburbs had been hit and that many hundreds of civilians had been affected, but it was impossible to ascertain from where the rockets carrying the chemical agent had been fired: the details of the likely trajectories would only emerge on September 17 in the UN inspectors’ report. But this was beside the point. Moscow was not seeking truth and clarity. To the contrary, its strategy was to “muddy the waters” about the Assad regime’s responsibility for August 21. The tactics had been established. First, Russia would assert that it has “evidence”, provided by Damascus, that suggested insurgents were responsible. Then it would make the claim that the attacks were carried out using “homemade” munitions. Then Moscow would accuse opposing powers of trying to avoid the real “truth” about the incidents. On September 4, as Moscow gained confidence from President Obama’s step away from immediate airstrikes, Russian State media resurrected the Khan Al Assal report with headlines such as “Russia releases key findings on chemical attack near Aleppo indicating similarity with rebel-made weapons”. A week after the attacks, on August 28 — as UN weapons inspectors were allowed into East Ghouta — Russian Foreign Minister Lavrov pushed for the US to hold fire on any decision to strike Assad, making a telephone call to US Secretary of State John Kerry to urge him to wait the results of the UN investigation. “A chance must be given,” Lavrov said, for a “political solution” to the Syrian crisis. Lavrov’s move was a stalling tactic, as well as an attempt to portray its ally, the Assad regime, as cooperative — and hence not culpable — in the efforts to find out what happened on August 21. Such a stalling tactic had two main advantages for Moscow and for its ally. The first was practical — delaying any US military intervention gave Assad breathing room to both continue his offensive against the Damascus suburbs (that was postponed only for the short hours the UN inspectors were in the Ghouta region) and to move his military assets out of harm’s way. 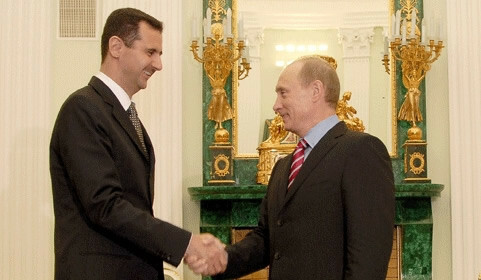 On the same day as Lavrov told Kerry to give the UN time to work, Assad evacuated personnel from army and security command headquarters in the center of the capital, including the General Staff Command Building on Umayyad Square, the nearby air force command and the security compounds in the Western Kfar Souseh districts. The second advantage for Russia was that, by encouraging the US to wait for the results of the UN report, it had more time to continue its propaganda campaign over the events of August 21. Yet, while Moscow’s move to stall US airstrikes worked, it walked a dangerous line. Russia was well aware that the very UN report it was urging the world to wait for would certainly show that a wide-scale chemical weapons attack had occurred on August 21. And while it was outside the mandate of the UN Mission to apportion blame, Russia knew the findings would likely point very strongly to regime culpability. How could Moscow guard against the possibility of the report — which it knew would be out by mid-September — from showing that Assad was to blame for the August 21 attacks? Russia could no longer count on delay and stalling tactics. Its campaign of disinformation — which aimed to create a strong enough counter-narrative that the insurgents could have been to blame — was gaining some traction in international media, but would that be enough to counter a strong UN report? Time was running out for Russia and Assad. But what initiative could Moscow take to go on the offensive? On Monday, September 9 the diplomatic tide turned for Russia and the Assad regime, when a way out of an increasingly difficult situation was handed to them from a surprising source — the US Secretary of State, John Kerry. Lavrov seized on what was likely a throw-away response from Kerry, and turned it into a diplomatic breakthrough. As Kerry was sitting in an airplane en route from London To Washington, his Russian counterpart telephoned to inform him he was about to make a statement in Moscow. That statement was put out even before Kerry landed in Washington. We are calling on the Syrian authorities [to] not only agree on putting chemical weapons storages under international control but also for its further destruction and then joining the Organization for the Prohibition of Chemical Weapons…We have passed our offer to [Syrian Foreign Minister] Walid al-Muallem and hope to receive a fast and positive answer. Al-Muallem — in Moscow for talks with Lavrov — seized on the idea, saying that the Assad regime was willing to consider it. Who else benefited from Russia’s opportunism? US President Obama, who had already implemented a stalling tactic of his own, talking up airstrikes but insisting that these be delayed until he had consulted Congress. By the end of Monday, Obama was saying that the Russian proposal to monitor and ultimately destroy Assad’s chemical weapons “could potentially be a significant breakthrough”. Assad could breathe easier. And Moscow could celebrate: on the verge of defeat in late August, it had thrown up smoke screens and stalled until it had an opportunity to turn the diplomatic table to its advantage. Russia’s isolation [is] one step closer to being complete….Its veto power in the United Nations will be even more irrelevant than the United Nations itself. With shrinking political, military, and economic influence, and with frustration growing in Europe and the United States with Vladimir Putin’s policies, it seems that the West may be moving away from Russia faster than Russia is moving away from the West. PreviousIran Special: 16 Political Prisoners Released — More to Come, including Mousavi and Karroubi?